They may reside a continent apart but Jonathan Byrd and Natalie Gelman are bound by the passion and love of song. In a venue built for the power of the beautifully sung word, both artists exhibited their inimitable styles to present an evening saturated in verse suitably fired up from the inspiration of urban and rural surroundings. This was an explicit outpouring of American folk music, engineered by the guitar and driven by the soul. The contrasting façade of each performer masked an inner desire to communicate, enthral and entertain via their gifted medium of music. Experience, enhanced profoundness and previous UK awareness enforced the seniority of Jonathan on the bill as he built on his impressive performance at the Shrewsbury Folk Festival a couple of years ago. 2015 is shaping up to be a year of major British incursion for Jonathan as this is the first of three visits including a return festival date at the end of August. 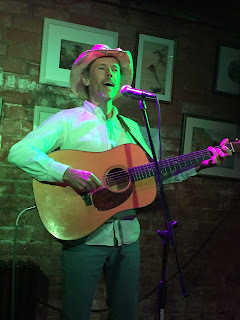 He also has a new album out over here soon recorded with his band The Sentimentals and we were afforded a trio of tracks to preview the release as part of his twin set approach to headlining the evening. However prior to Jonathan sharing his wares with the audience, the stage area was owned by Natalie for forty minutes as she set about establishing herself in the UK. A native of growing up in New York City, or to be more precise the West Village, Natalie now resides many miles from the east coast in Southern California but still retains that air of a schooled and archetype urban singer-songwriter. Unravelling a few guitar hitches was a minor hindrance for an artist possessing the temperament, grandeur and skill to exploit the fruits of her gift. These include the vocal range to sprinkle the air with a flurry of beauteous notes, the adeptness to mould her songs into that iconic acoustic sound and an ear for a tune to spin the thoughts of her inner mind into a palatable product. Having been recently acquainted with the music of Natalie via her 2013 EP STREET LAMP MUSICIAN, it was a pleasure to listen to the title, and strongest track, live. Hopefully Natalie will be in a position to expand on her back catalogue in the forthcoming months with songs heard on the evening such as ‘Some People’, ‘I Feel like a Photograph’ and ‘The Answer’ being ripe for the recorded format. 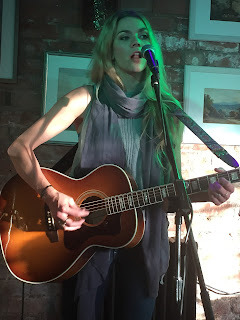 By the time she concluded her set with a soulful and exquisite version of the Goffen/King classic ‘One Fine Day’, many Kitchen Garden Café folks had warmed to the confident, charming and alluring presence of Natalie. The intention to return to these shores next year was the parting shot of Natalie Gelman, an artist you have got a fair chance of hearing more about in the future if the winds of fortune blow in a rightful direction. With the evening being more than suitably warmed up from Natalie’s opening set, the poise, stature and exuded panache of Jonathan Byrd hit the traps immediately with a string of popular tunes from his 2010 album CACKALACK. ‘Chicken Wire’, ‘I Was an Oak Tree’ and ‘Wild Ponies’ led the way from this release which was later followed up by the emotive, deeply personal and somewhat topical song ‘Father’s Day’. As previously mentioned, the new record is due to get a UK release on Fish Records soon and from MOTHER TONGUE, Jonathan chose ‘On the Edge’, ‘Love is the Law’ and ‘Supernatural’ to preview its content. The latter was one of many songs on the evening to invoke audience participation, while the middle of this trio is one of the picks on the album. Having caught Jonathan previously at the Shrewsbury Folk Festival and being suitably impressed, this more intimate surrounding leapt him up the appreciation scale. He is an artist born to perform and forever sealed to a platform designed to share his songs with a willing audience. The Kitchen Garden Café is made for evenings like this and credit to all concerned for bringing two outstanding artists to Birmingham in Jonathan Byrd and Natalie Gelman for one memorable show.